Whenever your stack gains its turn, the squares lit up around it show how far the stack can move during that turn. The movement range depends on the speed parameter of a stack. Clicking on one of the lit up squares makes the stack move onto it. After finishing the movement, the stack will not be able to undertake other actions until it gets its next turn. There are impassable objects, like rocks, on the battlefield sometimes. Foot troops will have to go around them, while flying or teleporting creatures can get over them, yet still cannot land on them. If there is a hostile stack within the movement range, an order to attack it can be given to any of your creatures. The creature will cover the distance to the enemy stack and attack it in the same turn. When you point to an enemy stack, the cursor changes to a sword. 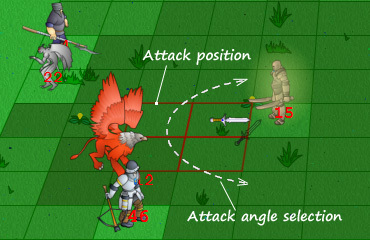 Move the cursor around the enemy stack to choose the direction of your attack. The square that your creature will attack from will be lit up. This order can only be given to troops disposing of ranged weapons and having some ammo. 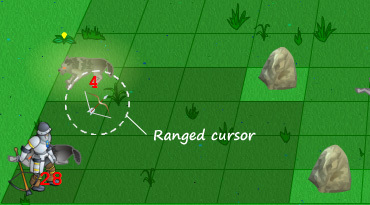 Point your cursor to any enemy creature, and the cursor will change to a bow. Range is very important while shooting. Sharp shooting is limited within the range parameter of every shooter. The shooting stacks lose their ability to shoot if there is an enemy stack directly adjacent to them. In that case shooters can involve into melee combat or step aside, yet in the latter case they lose one turn. It is also possible to force shooters to lead a melee attack from distance by Shift+clicking an enemy stack within their movement range (not shooting range). 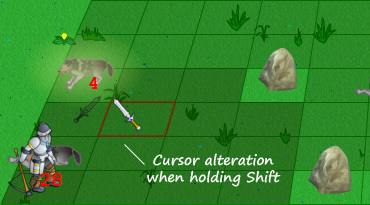 The cursor will change to sword from bow as long as you hold down the [Shift] button.